The Double-Latch Vertically Compliant Manual Actuator (DL-VCMA) Plus™ features improved ergonomic, thermal, electrical and mechanical performance to help lower your cost of test. 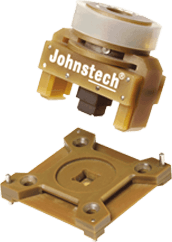 If you would like a copy of the Maintenance & Inspection Guide for this product, please contact info@johnstech.com. You also may contact your regional sales representative or distributor as well. Actuator latches onto contactor and engages package automatically when knob is turned. New more ergonomic easy-grip knob for easier and more productive operation.